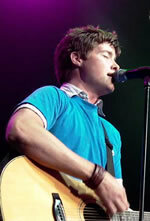 Hailing from Canada and adopting its name from Bruce Cockburn's 1976 song, "Lord of the Starfields", Starfield is composed of brothers Tim and Jon Neufeld on vocals and guitars, drummer John Andrews and bassist Shaun Huberts. Possessing a cognizance beyond their years, knowing both what they want to do as musicians and what they want to do as children of God, these young men are fusing their talents and mission to challenge their generation to strengthen their faith and make it their own. Starfield came together in a very natural, unforced, kind of way, growing out of each of the Neufelds' interest in music and desire to make music that would connect with the church. 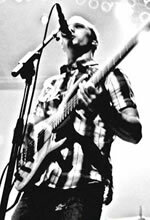 While Tim was leading worship at churches and college campuses across the country, brother Jon was learning the ropes of worship and the signatures of modern rock through his home church. Joining creative forces, the two of them and their friends cobbled together any gig they could find, eager for the opportunity to play. When the time felt right, and when they had drawn together enough songs and money, the promising band made its first recordings. Two years of touring and honing their sound brought Starfield the opportunity to record a second independent project that brought the band into the radar of a diverse set of industry insiders, including longtime Canadian music journalist Karen Bliss (Rollingstone.com, Elle Canada, Audience), the brass at several major Canadian labels and finally the folks at Sparrow Records, where they found their label home. Tim acknowledges there was a dichotomy to having gatekeepers from the general market be interested in music made primarily for the church. "The whole mainstream connection, having Karen Bliss and mainstream labels interested in seeing where our music could go, was really encouraging," says Tim. "It was cool to have people not in Christian music say they liked the music, but we are most excited about leading our generation into a renewed sense of relationship with our Creator." Starfield's passion and light-speed allure will be revealed with its self-titled, May 18 national debut. Enlisting the aid of veteran producer Matt Bronlewee (Jars of Clay, Rebecca St. James, Natalie Imbruglia), the resulting project is a propulsive mixture of big-sounding rock tunes meshed with introspective and worshipful lyrics. Songs like "Filled With Your Glory," "Revolution" and "Ordinary Life" tap into the best traditions of anthemic rock, while tracks like "Love Break Me," "Tumbling After" and "Over My Head" play heavier on themes of surrender and vulnerability, encouraging the listener to turn inward while still hooking them with inventive musical approaches. It is existing right within the midst of their intended audience that gives Starfield the best vantage point to make an impact. "I really want to tap into the heart of my generation in a way that's brutally honest. I want people to connect with our music at a very vulnerable level." Tim continues, "There's a tide within the church that I believe is changing, a new understanding of what it means to be a Christian in the post modern world. This generation is searching for identity and relevance within that structure, for a Christianity they can sink their teeth into. As Starfield, we want to write the soundtrack to that movement." That transparency, the admission that life is never easy, but hard work and faith have ultimate rewards, accelerates the promise the band Starfield exudes. This band wants to do that work within the bigger framework the church provides. " We want to serve the church; coming alongside and encouraging the already-in-process ministry that's going on", Jon says. Starfield's generation of fans and industry observers alike have already taken the band's work to heart. In 2003, they garnered a Juno Award nomination (Canada's equivalent of a GRAMMY Award) and won five Vibe Awards (equivalent to the Dove Awards) for best Artist, Group, Song, Rock/Alternative Album and Worship Album of the Year. Additionally, after hearing an early copy of the new album, CCM Magazine says Starfield's music "resonates with vivid worship lyrics and melodies that recall acts like Jars of Clay, MercyMe, Delirious and early Sonciflood." That transparency, the admission that life is never easy, but hard work and faith have ultimate rewards, accelerates the promise the band Starfield exudes. This band wants to do that work within the bigger framework the church provides. " We want to serve the church; coming alongside and encouraging the already-in-process ministry that's going on", Jon says. Starfield's generation of fans and industry observers alike have already taken the band's work to heart. In 2003, they garnered a Juno Award nomination (Canada's equivalent of a GRAMMY Award) and won five Vibe Awards (equivalent to the Dove Awards) for best Artist, Group, Song, Rock/Alternative Album and Worship Album of the Year. Additionally, after hearing an early copy of the new album, CCM Magazine says Starfield's music "resonates with vivid worship lyrics and melodies that recall acts like Jars of Clay, MercyMe, Delirious and early Sonciflood."